Want to learn more about the city that the Legions guard? 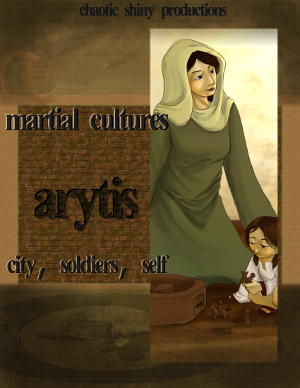 Martial Cultures: Arytis tells you more about the city of Arytis from Martial Flavor with 20+ pages of new and expanded content, including a city map and important NPCs. There's also more crunch, in the form of new alternate class features and feats. Buy MC: Arytis now for only $7.75 $4.95! What can Martial Cultures: Arytis do for me? If you're a DM, it gives you a lot more information on putting the city in your campaign. There's a city map, information on local politics, descriptions of important NPCs, and far more background on the Legion. There's also suggestions for ways of using an especially malevolent or benevolent version of Arytis. If you're a player, there are more feats and class powers for you, plus a lot more information about the city that you can use when coming up with your backstory. You can decide which district you grew up in, which politicians you support, and what honors you were awarded while serving with the Legion. If you didn't buy Martial Flavor, this book still has all you need to put the city of Arytis in your game. If you did, there's ten pages of extra content that simply wouldn't fit into the main book just waiting to be explored.